The spectacular crossover of Senior Minister Pallewatte Gamaralalage Maithripala Yapa Sirisena from the United Peoples Freedom Alliance (UPFA) Government headed by Mahinda Rajapaksa to the opposition and related developments have evoked memories of another crossover from government benches to the opposition by another senior minister from the Rajarata 50 years ago. It was on December 3, 1964 that Charles Percival de Silva the then Minister of Land, Irrigation and Power in the Sri Lanka Freedom Party(SLFP) Government of Sirimavo Bandaranaike crossed over to the opposition with a group of MPs. The CP de Silva crossover as the event was generally described resulted in the Sirimavo Bandaranaike Government being defeated in Parliament. The fact that CP de Silva represented and Maithripala Sirisena represents the Rajarata in Parliament have led many to draw striking parallels between these two political leaders. The comparison however is not quite apt because while there are some similarities on the one hand there are crucial differences too on the other. CP de Silva was an adopted son of the Rajarata having been born in Balapitiya in the South and obtaining his secondary education at the school by the sea in Mt. Lavinia. After retiring early from Government service CP de Silva relocated to the North-Central Province and contested the then Polonnaruwa electorate on the SLFP ticket in 1952 and won and retained it in 1956. Thereafter he contested the newly carved out Minneriya electorate in the Polonnaruwa administrative district and was elected in the March 1960, July 1960 and March 1965 parliamentary elections thereby earning the sobriquet, “Minneriya Deiyo”. Maithripala Sirisena was a native son of the Rajarata being born and bred in the Polonnaruwa District. He completed his secondary education at the Polonnaruwa Rajakeeya Madhya Maha Vidyalaya (upgraded to a top educational institution through CP de Silva’s efforts). Unlike CP de Silva who contested Parliamentary elections under the old first-past-the-post system, Sirisena’s entry into the electoral fray was under the proportional representative system. He contested in the Polonnaruwa electoral district under different party tickets like the SLFP, PA and UPFA. He won the elections in 1989, 1994, 2000, 2001, 2004 and 2010. 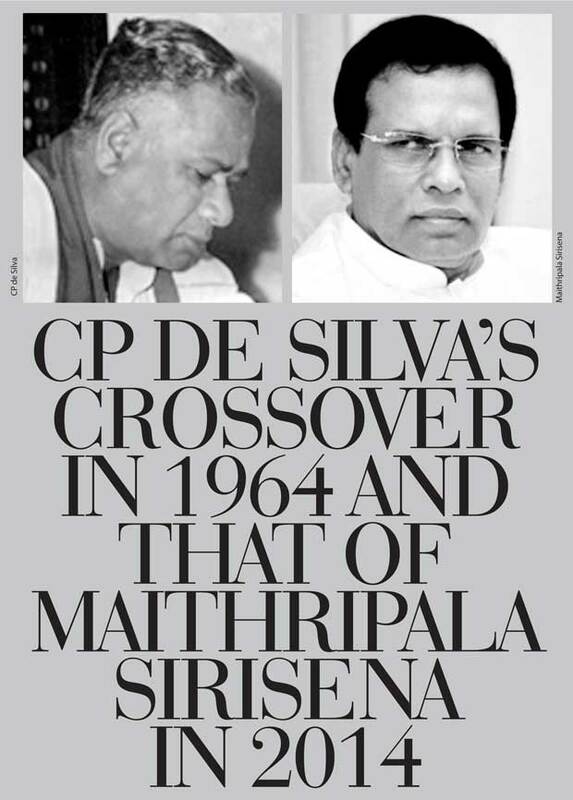 A vital difference between the CP de Silva-led crossover of 1964 and the Maithripala Sirisena-led cross over of 2014 is the manner in which both events unfolded. Those who engineered the crossover in 1964 maintained a strong sense of secrecy until the very last. The actual crossover was an act of high drama enacted within the august precincts of Parliament itself. Though there were speculation and rumours floating around of potential defections, people were generally in the dark until the event took place in the house. CP de Silva first informed Prime Minister Sirimavo Bandaranaike in writing about his intention to crossover on the morning of December 3, 1964. When he entered Parliament later that evening, CP de Silva demonstrated his intention clearly by sitting on an opposition bench instead of his usual seat on the Government side. He also made a brief speech in Parliament explaining his reasons for crossing over. Finally he along with 13 other Govertment MPs voted with the opposition against the Government. In the case of the Maithripala Sirisena’s crossover, the strategy adopted seems to be different. Sirisena gave no notice to President Rajapaksa of his intention to do so in the way CP de Silva informed Ms. Bandaranaike in 1964. Moreover the crossover was not enacted in Parliament as in the case of CP de Silva. Instead it was announced to the world at large by way of a media conference where Sirisena was flanked by former President Chandrika Bandaranaike Kumaratunge and some ministers and MPs who crossed over with him. Though it was said that around 20 to 30 MPs were ready to crossover, only seven including Sirisena were present at the news briefing. Subsequently two more MPs and a minister also crossed over at different times. More crossovers are expected in the near future. "In 1964 the two chief strategists behind the CP de Silva defection were opposition and UNP leader Ranil Wickremesinghe’s father Esmond Wickremesinghe and uncle Junius Richard Jayawardene. In the current exercise it is well-known that Ranil played his cards close to his chest thus keeping everyone guessing as to who would be the presidential candidate. " If the architects of the 1964 crossover relied on a covert yet effective strike to bring about the fall of the then Government by defeating it in Parliament through a massive exercise of defection, the crossover planners of 2014 are adopting a different strategy. Instead of engineering a mass crossover of MPs as in 1964, the tactic in 2014 seems to be that of encouraging defections over a period of time. The idea seems to be that of promoting a trickle of crossovers at regular intervals.This exercise intends building up a certain momentum that would strengthen the anti-Mahinda propaganda at the presidential elections. The strategy is not to shock and awe with a mass crossover but to de-stabilise the Government gradually through a staggered defection exercise. An important factor in calculations now is the advent of the presidential elections. Under the Prime Ministerial system prevalent in 1964 the ultimate aim was to defeat the Sirimavo Bandaranaike Government in Parliament and bring about elections. Power then was in Parliament. The Prime Minister was “Primus Inter Pares”or first among equals. Nowadays it is the executive president who is all powerful. Those seeking power or the overthrow of those ensconced in power need to set their sights on the presidency. The forthcoming elections provides such an opportunity. Therefore the defection exercise at this juncture focuses more on the presidential poll than changing the balance of power in Parliament. It is against this backdrop that the defections are being encouraged in small batches on a regular basis instead of a mass crossover. However a large scale defection cannot be ruled out just prior to or in the immediate aftermath of Jan 8, 2015. Thus it could be seen that there are significant differences between the defections spearheaded by CP de Silva in 1964 and by Maithripala Sirisena in 2014. However there do exist some similarities at a very minor and superficial level among both. More importantly the defection exercise of 1964 does evoke a sense of déjà vu in 2014. An interesting aspect contributing to these feelings is the fact that several of the principal actors featuring in the current crossover exercise are family members of those involved in the 1964 defection drama. In 1964 the two chief strategists behind the CP de Silva defection were opposition and UNP leader Ranil Wickremesinghe’s father Esmond Wickremesinghe and uncle Junius Richard Jayawardene. In the current exercise it is well-known that Ranil played his cards close to his chest thus keeping everyone guessing as to who would be the presidential candidate. Likewise in 1964 it was the then Lake House boss Esmond Wickremesinghe, his kinsman JR Jayewardene and then opposition leader Dudley Senanayake who were greatly responsible for the defection. Interestingly the MP who crossed over first in the current exercise was Gampaha District parliamentarian Vasantha Senanayake the great grandson of DS Senanayake and Grand nephew of Dudley Senanayake. The MP who did much of the spadework in enticing Maithripala Sirisena and others was Matara district MP Mangala Samaraweera. In December 1964 Mangala’s father Mahanama Samaraweera was the minister of communications in the SLFP Government of Ms. Bandaranaike. He had earlier been the minister of Local Government and Housing. Mahanama Samaraweera was the second minister to cross over in 1964. He followed on the heels of CP de Silva. Interestingly Chandrika Bandaranaike Kumaratunge is currently on the side of the defectors. In 1964 the situation was different with MPs defecting from the Government headed by her mother Sirimavo Bandaranaike. Ironically the Rajapaksas of yore were all loyal supporters of Ms. Bandaranaike then. Beliatta MP DA Rajapaksa and his nephews George Rajapaksa of Mulkirigala and Tissamaharama MP Lakshman Rajapaksa stood by Sirimavo then. Now the Rajapaksas in Parliament – Chamal, Basil, Nirupama and Namal are all supporters of Mahinda Rajapaksa. What prompted the Rajarata stalwarts CP de Silva and Maithripala Sirisena to “renegade”from their parties in 1964 and 2014? Both had loyally supported the SLFP through thick and thin. Both had long stints as cabinet ministers and enjoyed positions of influence in the hierarchy. CP de Silva was the deputy head of Government and leader of the house. Had it not been for two quirks of fate CP would have been Prime Minister in 1959 and 1960. Sirisena was the longstanding secretary of the SLFP and a strong contender for the post of Prime Minister after DM Jayaratna. Yet both chose to quit their parties at critical junctures seemingly motivated by loftier ideals. By an ironic coincidence the crossover dates of both Maithripala Sirisena and CP de Silva occurred within weeks of each other but certainly not the same year. Sirisena announced his defection on November 21, 2014. CP de Silva crossed over fifty years earlier on December 3, 1964. The golden anniversary of the CP de Silva-led crossover was early this week. The 1964 defection exercise is an important event in the political history of post-independent Ceylon/Sri Lanka. It is indeed worthwhile to delve into that event in a bid to understand the past, analyse the present and anticipate the future. To comprehend fully the crossover of CP de Silva in 1964 and place that defection in context, it is extremely useful to know more about the man hailed as the ‘Minneriya Deiyo’. CP de Silva was a great son of Sri Lanka who did much to develop agriculture and irrigation thereby emancipating the lot of the humble farmer and peasant. In his own way he was a man of high principles and ability who deserved to be the head of state in the land of his birth. This however was not to be. C.P. de Silva was born on April 16, 1912 at Randombe in Balapitiya. His parents were C.R. de Silva, a lawyer and Ms. Adlin de Silva, a co-founder of Musaeus College. He was the eldest in a family of four boys and two girls. CP obtained his primary education at Dharmasoka College, Ambalangoda and secondary education at S. Thomas’ College, Mt. Lavinia. Graduating with a BSc special degree in Mathematics (first class) from University College he went to London for further higher studies. While in London he sat for the Ceylon Civil Service Examination and entered the Ceylon Civil Service in 1935. "By an ironic coincidence the crossover dates of both Maithripala Sirisena and CP de Silva occurred within weeks of each other but certainly not the same year. Sirisena announced his defection on November 21, 2014. CP de Silva crossed over fifty years earlier on December 3, 1964. The golden anniversary of the CP de Silva-led crossover was early this week. " CP de Silva was the assistant government agent in Anuradhapura and Polonnaruwa Districts for almost ten years. In 1949 he was appointed Director of Land Development under Dudley Senanayake who was Minister of Agriculture in the DS Senanayake Government. CP resigned from the Civil Service in 1950 while holding the post of Director of Land Development because of an issue with his Minister Dudley. The long-abandoned Minneriya reservoir was restored and inaugurated by D.S. Senanayake . The task of restoring the vast Minneriya reservoir and developing lands and allocating lands to farmer families fell on the shoulders of C.P. de Silva who was then AGA of Polonnaruwa. CP’s work in Rajarata gave him an insight into the plight of the poverty-stricken Rajarata peasantry. His sincere dedication and selfless service to the people of Rajarata in general and the people of Polonnaruwa in particular was greatly appreciated. People of Polonnaruwa began referring to him with affectionate devotion as the “Minneriya Deviyo” or “Deiyo”. After SWRD Bandaranaike defected from the United National Party and formed the Sri Lanka Freedom Party in 1951, he began scouting around for fresh talent for the SLFP. CP de Silva the civil servant had retired early from Government service and was now a “gentleman farmer”. Bandaranaike met CP de Silva a fellow old Thomian and succeeded in enticing him to Politics. CP contested the 1952 polls in Polonnaruwa and was one of the nine MPs elected from the SLFP. Due to his qualifications, abilities and dedication CP de Silva became one of the top leaders of the SLFP.He was re-elected as Polonnaruwa MP in 1956 also. The Parliamentary elections of 1956 was a watershed in the political history of this Island nation. The United National Party (UNP) that was inpower from 1947 was defeated. The Sri Lanka Freedom Party led by SWRD Bandaranaike swept the polls as part of a coalition known as the Mahajana Eksath Peramuna (MEP). Bandaranaike became the Prime Minister of the then Ceylon. The MEP coalition was an assorted mix of various political persuasions. There was also in broader terms a division along the traditional right wing and left wing politics. Philip Gunewardena the “Boralugoda Sinhaya” commanded the leftists while the duo comprising CP de Silva the ‘Minneriya Deiyo’ and Wijayananda Dahanayake known as “Banis Maamaa” led the rightists. The country was undergoing vertical and horizontal tensions. On the one hand there was overt inter-ethnic strife on the grounds of race while there was on the other hand covert tussles on the basis of class and ideology. Sadly the racial dimension was exaggerated or distorted to divert focus away or to under-emphasise the class dimension. In any event the right-wingers in the party were worried about the ascendancy of the left in government and the party and began plotting a reactionary counter strike. The aim was to drive out or undermine the leftist tendency within MEP folds. The 1959 annual party convention was held in Kurunegala. The right wing was on the ascendant. Internal party elections saw the “leftist” candidates being defeated decisively. It was a “right” royal sweep. This heralded the exit of the left. On May 18, 1959 the Agriculture and Food Minister Philip Gunewardena resigned his portfolio. Bandaranaike formed a fresh cabinet on June 9. Senator WPH de Silva who retained his portfolio of Justice Minister resigned two days later. Seven left-leaning MP’s quit ranks thus depleting the government’s parliamentary strength to just 47 out of 101. The purge of leftists and the assertion of the rightists was a conspiracy to shackle SWRD Bandaranaike. Prime Minister SWRD Bandaranaike was shot by Talduwa Somarama Thera on September 25, 1959. He died on the 26th. After Bandaranaike’s death, the Education Minister Wijayananda Dahanayake was sworn in as Prime Minister. The colourful Parliamentarian became PM through luck. Lands and Irrigation Minister CP de Silva was the most senior minister and leader of the house. He was widely regarded as S.W.R.D. Bandaranaike’s able deputy and potential successor. Had CP been in Colombo, he and not Dahanayake would have been acting for Bandaranaike. But what happened was that on August 25, 1959, CP had drunk a glass of milk in the boardroom where the cabinet met. It was suspected that the glass contained some vegetable-derived poisonous substance. The intended victim was supposed to be the Prime Minister himself. CP’s condition proved so critical that he had to go to London for medical treatment. He was still in London when the assassination occurred. It was in this manner that fate played a trick on CP. Bandaranaike had earlier been scheduled to fly to New York on the evening of September 26 to attend the UN general assembly sessions. Since CP de Silva was away Bandaranaike decided to get Wijayananda Dahanayake appointed as acting premier. On September 24, SWRD had prepared and signed the papers authorising the Governor General to swear in Dahanayake as acting prime minister. So when Bandaranaike died it was Dahanayake who donned the premier’s mantle. Upon hearing of Bandaranaike’s shooting, the convalescent CP discharged himself from hospital despite not having fully recovered and returned home. But it was too late and by the time he arrived in Colombo, SWRD had died and Dahanayake had assumed office as Prime Minister. The shrewd Daha met CP at the airport and accompanied him to Horagolla to pay the last respects to their departed leader. Daha then took CP to the Governor General at Queens House and got him sworn in as Agriculture, Lands and Irrigation Minister. Events had overtaken and negated CP’s rightful claim to the PM’s post. But his role as Minister in the Dahanayake cabinet was short-lived. CP was ejected from office in an overnight putsch by the new Premier. Dahanayake’s brief tenure as Prime Minister was a disaster. He did not enjoy the confidence of his cabinet. The cabinet did not trust him. Five ministers including C.P. de Silva were removed from office by Daha on December 8, 1959. Two ministers resigned their posts on December 10. Five more ministers were fired by the Premier on January 10, 1960. It was like the “off with their heads” rant by Lewis Carroll’s Red Queen. Prime Minister Dahanayake dissolved Parliament on December 5, 1959. There had been a no-confidence motion against his Government by the opposition. Daha won by a single vote, but knew the writing was on the wall. After dissolution Dahanayake remained head of a caretaker Government. The announcement of an election transformed the political climate. SLFP big-wigs were rattled. The mood in the country was against the ruling party and the Government. The hopes of the chief opposition United National party (UNP) was rising after the re-entry of Dudley Senanayake. Meanwhile, C.P. de Silva was doing his best to keep the party together and bring about a political renaissance. Given his qualifications and experience, the mantle of leadership should have been rightfully his. He would indeed have been premier, but for his absence due to illness caused by food poisoning. Also, being away in London, CP was not tarnished by any suspicion of involvement in the SWRD assassination. Despite this, several moves were on within the party to have a new leader. There were open and hidden reasons for this. The public reason given was that CP was not a charismatic mass leader. Though his efficiency was accepted, it was argued that he would not be able to attract the masses and win elections. There was some truth to this assessment. There was, however, another less-publicised reason. Notwithstanding his impressive credentials, CP had a minus point due to the socio-political environment of the country. He did not belong to the numerically large Govigama caste. CP de Silva was from the Salagama caste. The Govigama caste was the single largest caste in the country. Its members claimed they were at the top in the caste pecking order. Although castes originated on the basis of traditional occupation, the anachronistic social stratification remained a hidden yet effective factor in politics. However much people argue that casteism is extinct and find it unfashionable to discuss it publicly, the fact remains that caste is indeed a factor to reckon with in politics. This is particularly so in the case of hierarchical leadership. Apart from the exception or aberration of Ranasinghe Premadasa, every single prime minister, president or Governor General (apart from Lord Soulbury) in this country has been from the Govigama caste. It could be seen, therefore, that sections of the SLFP had their reasons to seek a substitute for CP. Despite these efforts, CP established his party leadership as there were no possible replacements at that time. So the party geared itself up for elections under CP’s command. He was projected as a potential premier. As the electoral campaign got underway, it soon became apparent that the SLFP was heading for definite defeat. Crowds dwindled and there was a visible lack of enthusiasm among party cadres. Without SWRD the party was like a rudderless boat. The circumstances of his assassination and the rumours circulating of an intra-party conspiracy saw demoralisation set in. It was at this point that the pragmatic C.P. de Silva realised the urgent necessity for someone to revitalise the party and inspire the voters. Who but the tragic widow of the departed Leader could do this? So CP and other SLFP leaders persuaded Sirimavo Bandaranaike to address election meetings. A reluctant Sirimavo hesitantly agreed. She started addressing public meetings. Huge crowds flocked to her meetings voluntarily. A significant feature was an unprecedentedly high turnout of women particularly in the rural areas. They empathised with her. Tears glistened in their eyes when Sirimavo Bandaranaike broke down. They sobbed loudly and wept uncontrollably when she cried. Despite her lack of eloquence, Ms. Bandaranaike moved crowds. When elections were announced, the SLFP had been discounted as a winner. But as election day drew near, it was clear that the party was doing very well. When results were announced, the UNP had come first with 50 seats but the SLFP came a close second with 46 seats. It was a hung Parliament. The LSSP and MEP had 10 each. The third largest party was the Ilankai Thamil Arasu Katchi (ITAK) with 15 seats. The ITAK was known in English as the Federal Party (FP) The FP seemed to be holding the balance of power in the new Parliament. Governor General Sir Oliver Goonetillleke regarded as partisan towards the UNP called upon Dudley Senanayake to form a new government as the party had the most number of seats in Parliament. It was however doubtful whether Dudley could cobble together the required majority to form a stable government. Both the UNP and SLFP began wooing the FP. An official SLFP delegation comprising CP de Silva, Maithripala Senanayake, AP Jayasuriya and Felix Dias Bandaranaike also met a FP team led by its leader SJV Chelvanayakam. Chelvanayakam placed four demands submitted to the UNP and to the SLFP. The SLFP at the outset declared that the party would not enter into a formal agreement with the FP. But the SLFP proposed to make an explicit policy statement on issues raised by the FP when it presented its own throne speech if and when asked to form a government after the anticipated fall of the UNP Government. The SLFP stated that all assurances and pledges on the issues concerned would be given concrete form as a statement of policy in the throne speech. There would however be no written pact or agreement. After laying down its cards openly, the SLFP told the FP that if the Sinhala party defaulted on its assurances the Tamil party always had the option of voting against it after the throne speech debate. Without FP support the SLFP Government would fall. As such the party cannot afford to dishonour its promises it was pointed out. "The SLFP winning 75 seats obtained a majority with six appointed seats and the support of a few independents and break aways from other parties. Ms.Bandaranaike made history by becoming the world’s first woman PM "
Parliament ceremonially opened on April 19. The Throne speech debate began on April 20. On the third and final day Chelvanayakam addressed the house and attacked the UNP harshly. When the vote was taken on April 22, the Federal Party voted along with the opposition against the UNP Government. The Throne speech was defeated by 25 votes. The Government had 61 and opposition 86 with eight abstentions.After an emergency meeting of the Cabinet, Dudley Senanayake recommended to the Governor General that Parliament be dissolved and fresh polls held. Sir Oliver however summoned the heads of all opposition political parties and told them that he was exploring prospects of forming an alternative government instead of holding elections. It was now the turn of the SLFP with 46 seats to have a go at government formation. The SLFP leader CP de Silva then called upon the Governor General and urged that he be given an opportunity to form a government. He said he had the required numbers and was confident of securing FP support. Thereafter Sir Oliver asked SJV Chelvanayakam to call over at Queens House to ascertain whether the FP was indeed extending support to the SLFP. On his way to Fort from his Alfred House Gardens residence in Kollupitiya, Chelvanayakam dropped in at Felix Dias Bandaranaike’s house in Mahanuge Gardens. Waiting there were CP de Silva and AP Jayasuriya. Once again Chelvanayakam queried whether the assurances given by the SLFP were still valid. The answer was in the affirmative. Then Chelva asked whether the essence of the BC pact would be implemented as promised. Again the answer was positive. At this stage Chelvanayakam looked at fellow old Thomian and potential premier CP de Silva and asked him point blank “what guarantee is there that you would honour these assurances”? To which CP de Silva gave a characteristic response. “I drive a hard bargain and when I’ve made it, I keep it” CP replied. A satisfied Chelva left for Queen’s House while CP de Silva awaited his tryst with destiny. Alas! Fate decreed otherwise. Sir Oliver Goonetilleke received Chelvanayakam and told him that he was trying to ascertain whether CP de Silva could form an alternative government. If the SLFP did not have the required numbers he was going to dissolve Parliament. Stating that the support of the FP was crucial in this respect the Governor General asked the FP leader categorically whether the FP would provide “unqualified” support to the SLFP-led alternative government for a minimum period of two years. Sir Oliver had stressed on “unqualified” support because he felt that the FP could be forced to withdraw support quickly if the SLFP reneged on its pledges to the party. Therefore he wanted to satisfy himself of it’s stability by eliciting a firm guarantee from Chelvanayakam. But the lawyer in Chelvanayakam balked at the prospect of pledging “unqualified” support as requested by the GG. Being an honourable politician, Chelvanayakam realised that he and the FP would be firmly bound for two years if he stated so to Sir Oliver. At the same time he could not take the political risk of extending unqualified support for 24 months if the SLFP dishonoured its assurances. In a bid to extricate himself from this tricky situation, Chelvanayakam gave what could be termed a “smart” answer. Chelvanayakam replied that the FP had arrived at an understanding with the SLFP and that his party would support the SLFP-led govt not merely for two years but for its full term. By this answer Chelvanayakam had avoided giving a categorical assurance about extending “unqualified support”. But the politically sagacious Sir Oliver cited this perceived reluctance on the part of the FP leader to explicitly guarantee unqualified support as proof of the proposed government’s “fragility”. Stating that he was dissatisfied by Chelvanayakam’s answer the Governor General went ahead and dissolved Parliament. It is widely believed that Sir Oliver’s bias towards the UNP was the cause for this and that the Governor General had made Chelvanayakam the “scapegoat” for this. But there is also a less charitable explanation for Sir Oliver’s conduct. According to Chelvanayakam’s son-in-law and political scientist AJ Wilson the real reason was “caste”. CP de Silva belonged to the “Salagama” caste. Wilson quotes Dr.N.M Perera as having been told by Sir Oliver “How can I appoint a Salagama man”? As stated earlier, although the concept of caste is frowned upon in polite Sri Lankan society and is tabooed as being politically incorrect, a harsh reality of politics and arranged marriages is the role of the caste factor in both spheres. As pointed out earlier, it is an incontrovertible fact of contemporary history that all the Governor Generals, Prime Ministers and Presidents of Sri Lanka have been from the Govigama caste with the singular exception/aberration of Ranasinghe Premadasa. Whatever the reason governing the Governor General’s action, the immediate consequence was dissolution and the staging of fresh elections. All opposition parties including the FP protested over Sir Oliver’s action and wrote a letter criticising the move. Nevertheless new elections were held in July 1960. The SLFP winning 75 seats obtained a majority with six appointed seats and the support of a few independents and break aways from other parties. Ms.Bandaranaike made history by becoming the world’s first woman Prime Minister. CP de Silva deprived twice of the chance to become Prime minister, functioned as a virtual deputy premier under Ms. Bandaranaike. He deputised as acting Prime Minister when Ms.Bandaranaike went abroad. This cordial working relationship between Ms. Bandaranaike and CP de Silva came under stress and strain after a few years. CP de Silva became disgruntled by the course of events. The coalition with the Trotskyite Lanka Sama Samaja Party (LSSP) in 1964 added to his discomfiture. The veteran leader was rather unhappy about the induction of the leftists. This rendered him vulnerable to the machinations of the opposition seeking the downfall of Ms. Bandaranaike’s Government. Finally CP de Silva crossed over and voted against the Government he himself had helped set up in 1960. The fascinating tale of that defection and consequent fall of the SLFP Government will be related in a forthcoming article.